As you may know, the Angry Birds Star Wars app came out earlier this month, and I think it’s quite good. Sure, it’s still basically Angry Birds with some Star Wars stuff added, but it’s been done intelligently, with some details that only Star Wars fans would really appreciate. The Empire Strikes Back and Return of the Jedi parts aren’t available yet, though, so we can’t see Jabba in the game just yet. 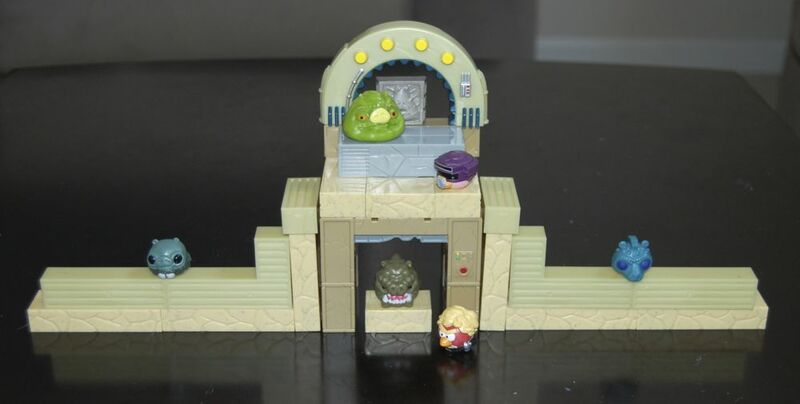 I wrote about the Jabba’s Palace Battle Game and Jenga Tatooine Battle Game earlier, and was a little critical of them as toys, since they’re quite simple. With the non-Jenga sets in particular there aren’t any rules — you just set up the blocks and try to knock them down. However, I will say that playing with an enthusiastic seven-year-old makes these sets a lot more fun. Over Thanksgiving vacation, my son and I played with the Death Star and AT-AT sets (which I managed to get for around half off, for the record) and enjoyed them quite a bit. I ended up buying all of the toy sets, partially because I wanted to get a complete set of the figures. In case anyone else wants to do the same, I thought it would be useful to come up with a checklist showing which figures come with which sets. There is a sort of checklist included with the toys, but it doesn’t give all of this information. (The figures in the Jenga sets are bigger and only have a subset of the characters available in the main sets, so I’m going to ignore these for the purposes of this checklist.) At present, there are 22 figures total, with 7 exclusive figures (meaning that you can only get the figure in one set or only in the randomly packed Mystery Bags). In addition to these, the Jedi Luke Bird is only available in the Mystery Bags at the moment, but since Hasbro doesn’t refer to him as an exclusive on their checklist I’m guessing that he will appear in a future set. As you can see, there are two figures that are only available in the Mystery Bags (plus Jedi Luke, as I mentioned above). Han in Carbonite is one that you would certainly want for a Jabba’s Palace display, but he should be fairly easy to “feel” in the Mystery Bags, since he’s the only flat character. I couldn’t find any at my store, so maybe someone beat me to him. I ended up getting the Mystery Bag-exclusive characters on eBay since I didn’t feel like spending $4 a pop to end up with figures I already had. By the way, here’s a little Jabba’s Palace setup that I tried making with the blocks from the Jabba’s Palace, Jenga Tatooine Battle, and Fight on Tatooine sets. I thought the archway from the cantina worked pretty well for Jabba’s archway. We had fun trying to knock this one down, and even used the Han in Carbonite Bird to attack a few times. also there in bootleg, got this weekend jabba and rancor.